As you work with your new computer, you might find that changing the appearance of various elements on your screen not only makes them more pleasant to look at, but also helps you see the text and images more easily. 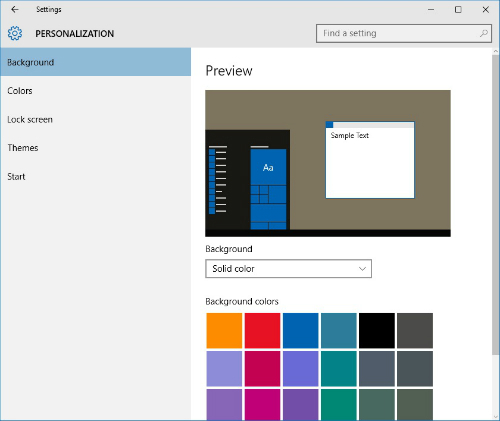 Windows 10 offers several preset background patterns and color sets you can choose from the PC Settings. Click the Start button and then click Settings. Click the Background drop-down list and choose a category, such as Solid Color or Picture. Click a background and then click the Close button. Some colors are easier on the eyes than others. For example, green is more restful to look at than purple. Choose a color scheme that’s pleasant to look at and easy on the eyes! You can change the background color of the Start menu, Taskbar, and Action Center. Click the Start button→Settings→Personalization and then click Colors in the left panel. Click to turn Automatically Pick an Accent Color from My Background to Off and then select an Accent Color. This sets the Accent color throughout Windows. Click Show Color on Start, Taskbar, and Action Center to On to set the background color for these regions. You can choose a Windows 10 picture for your lock screen (the screen that appears when your computer goes to sleep) or use one of your own pictures for the lock screen background. Click the Start button→Settings, and then click Personalization. Click Lock Screen in the left panel. 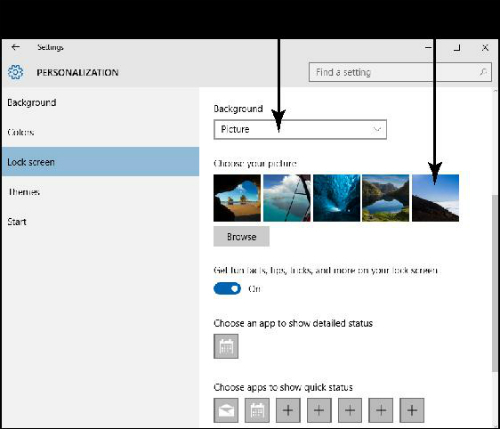 Click the Background drop-down list and choose a category of background, such as Picture (to choose from Windows images or one of your own) or Windows Spotlight for the preset Windows image (see the following figure). Click one of the pictures displayed, or click Browse to choose another picture. If you chose to browse for one of your own pictures, from the Pictures folder that displays click a picture to use. If the picture is located in another folder, click the Go Up link to browse other folders. You can also choose a few apps that you want to keep running when your lock screen appears. On the Lock Screen tab shown in the preceding figure, just click one of the plus signs to display the apps that are available to display, such as Calendar or Mail.